Our congregation follows the traditional church calendar, with worship themes celebrating special days such as Palm Sunday (the week before Easter) and in keeping with liturgical seasons such as Advent (celebrated the four Sundays before Christmas) and Lent (the five Sundays before Easter). In addition, other holidays, such as Thanksgiving, Mothers’ and Fathers’ Days, or Veteran’s Day, may be incorporated into worship in various ways. Christmas Eve on December 24 includes a lively, child-friendly celebration at 5 p.m., followed by a quieter, more reflective service at 9 p.m.
A service on Ash Wednesday, beginning the season of Lent, takes place at 7:30 p.m.
Holy Week events include Maundy Thursday, with a 6:30 p.m. soup supper followed by 7 p.m. communion and foot washing. On Good Friday we gather at 7:30 p.m. and then a walk with a large wooden cross to Meetinghouse Hill. On Easter morning, in addition to the grand and joyous 10 a.m. service in our sanctuary, an outdoor service takes place at sunrise by the cross on Meetinghouse Hill, followed by a breakfast reception at the church. Two other seasonal Sunday morning services take place away from our sanctuary. 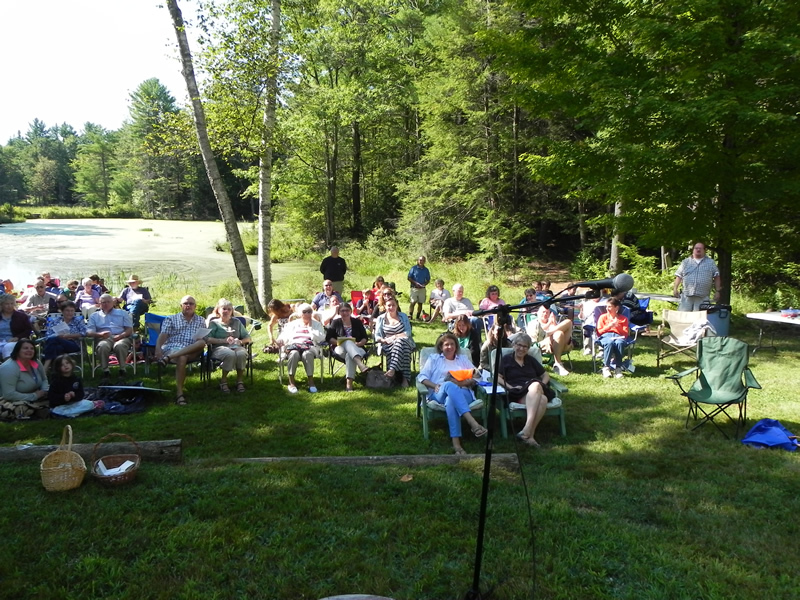 In the summer, an August outdoor worship service takes place at Veasey Park. In the fall, during the weekend of the Deerfield Fair, there is not a worship service in the sanctuary.